Chikuwa no Isobeage ('竹輪[ちくわ]の磯辺揚げ', is classified into deep-fried food), is known as Deep-fried Tube‐shaped Fish Paste with Green Laver in English, and 海苔炸竹轮 (Hǎitái zhà zhú lún) in Chinese. It is the washoku. 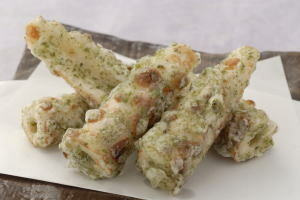 Fried Chikuwa, Deep-fried Fish-paste Cylinders in Seaweed-flavored Batter. Tube‐shaped Fish Paste, Oil, Dried Green Laver, Wheat Flour.